This comes at a very crucial time for those refreshing their walk with our Lord. We’ve been shown for God to be with us constantly we need to be seeking Him at all times not just when it is convenient or when we feel we need Him to intercede on our behalf. God pledges blessings unto those following His laws. But He also has set curses against those who will walk outside of His Laws and Statutes. Many situations we find ourselves in will not occur if we are seeking to be closer to God through learning what the Holy Spirit is offering. Learning to discern and decipher and understand what Yahweh is offering and available through following His laws and statutes simply by making it our primary objective. We must never forget to fear God because we have become complacent in our walk. What Moses related in Deuteronomy 6:4 Hear, O Israel: The Lord our God is one Lord. Was a warning to the Israelites but fervently applies as well today, my caution is not to fall into thinking what we are doing is right in our own minds, v5 And thou shalt love the Lord thy God with all thine heart, and with all thy soul, and with all thy might. I can hear the excuses “How can I do that I’m so busy and there are so many distractions, and besides I wouldn’t be accepted.” Moses describes what must be done to overcome these fears in v14: Ye shall not go after other gods, of the gods of the people which are round about you. Then describes in detail what we don’t want to do because we think what we are doing is right in our own minds in v15: (for the Lord thy God is a jealous God among you) lest the anger of the Lord thy God be kindled against thee, and destroy thee from off the face of the earth. Moses went on in v16 cautioning not to tempt God as I believe through our complacency today of Political Correctness within the teachings of the Worldly churches we have tempted Yahweh stirred His anger. But as well aroused His compassion giving us a second chance to recognize our folly and return to following His laws and quell His upcoming anger towards those outside of them. The events over the past years of all the warnings and calls to come back I believe are God showing His Love for His obstinate children to get back to Him and be obedient again so we would not suffer His wrath. As Matthew Henry points out in his commentary of Philippians 4:4-9 v4: Rejoice. v5: Let your moderation be known unto all men, The Lord is at hand. 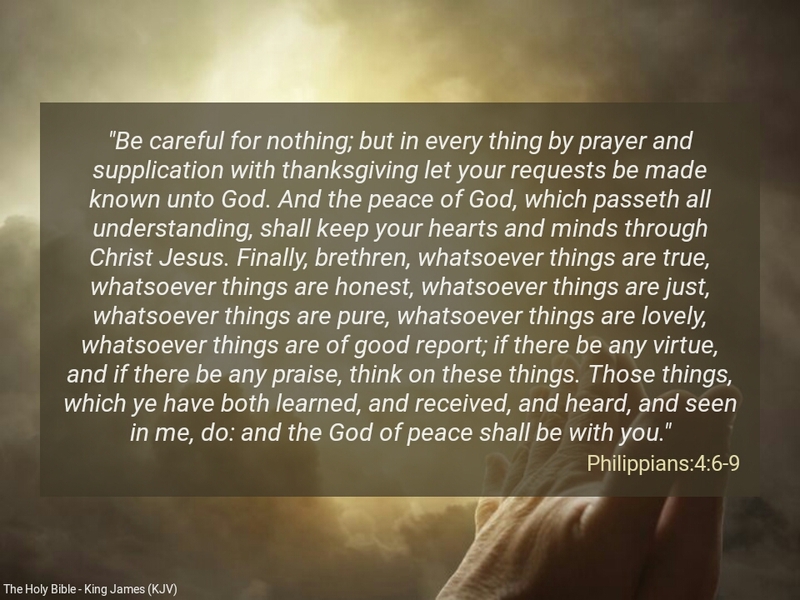 v6: be careful for nothing but in everything by prayer and supplication with thanksgiving let your requests be made known unto God. v7: And the peace of God, which passeth all understanding, shall keep your hearts and minds through Christ Jesus. v8: Finally, brethren, whatsoever things are pure, whatsoever things are lovely, whatsoever things are of good report if there be any virtue, and if there be any praise, think on these things. v9: Those things, which ye have both learned and received, and heard, and seen in (Yeshua), and the God of peace shall be with you. Ok, now we are getting down to the nitty-gritty of what God means when he called us to follow his laws yes there are blessings many of them described in Deuteronomy 28. However, there are curses as well described in Deuteronomy 28 which to this day apply to those who walk outside of Gods laws again I cannot emphasize how important it is to heed God’s call to return to following His laws (Ten Commandments). Caution again do not fall into the category of thinking what we are doing is right in our own minds, because this thinking rewarded the Israelites God’s wrath, and we have just learned we don’t want to see or feel His wrath. CLOSING COMMENTS by Robert: How can I think that the problems many suffer in the world today are because of God’s curses described in Deuteronomy 28:45 -46 v45: Moreover all these curses shall come upon thee. and shall pursue thee, and overtake thee, till thou be destroyed because thou hearkenedst not unto the voice of the Lord thy God, to keep his commandments and his statutes which he commanded thee. v46: And they shall be upon thee for a sign and for a wonder, and upon thy seed for ever. Here it comes what manner of God would do such a thing the God I follow wouldn’t do that, the God I know is a loving God and has understanding and compassion for those who follow him. Unfortunately, folks that particular god is the god being preached in the Worldly churches who is born every year and crucified every Easter. The God I worship the God I am writing about was born and raised by Joseph and Mary and was under Yahweh’s protection. To save his life at 2 years was taken to Egypt, was visited by the three Wisemen in a house at the age of two years. Yeshua walked among us and performed miracles and taught and for doing so was crucified laid to rest for three days and resurrected and after a time spent continuing his walk ascended to sit on his throne at the right hand of Yehwah. The God I worship is not reborn and crucified each year he reigns over His flock and teaches us through the Holy Spirit how to prepare ourselves for His return as promised. Remember these writings are the thoughts of an obedient 71 yr old servant who has enjoyed the promises and blessings of our Lord as I some years back came out of the darkness and guided by the Holy Spirit have been blessed spiritually. I write them as a Watchmen Sounding the Trumpet of impending danger and more recently sharing some guidance which hopefully will keep or bring you back to God’s path. I send my blessings and prayers and ask the Father to keep you and guide you back into our Father Yahweh’s loving Arms. Never forget Yahweh is a loving Father and as well a Chaste Father willing to punish as He is also a Jealous God wanting only to share His love and real compassion when we love, honor obey and cherish him with all of our heart soul and spirit.